We thought that it was time to show you some more of the fabulous From Me To You Range of clear stamps. This lovely little boy is on the Sunny Days Sheet, alongside our little girl holding a Sunflower and the sentiment 'Wishing You a Sunshiny Day.' We know you are loving the range and we will be bringing more out soon, so keep watching! Don't forget to check out Dawn's fabulous tutorials on previous Posts for using the Templates and the best news of all we have, at last, got the first of our own new designs of Templates here in the Studio. We are working on them as we speak and we will be launching them on the programme on QVC in June. 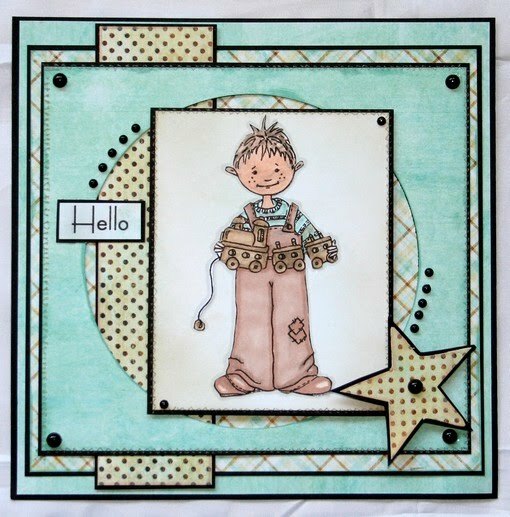 The Templates work alongside an absolutely gorgeous new range of clear stamps and we know you will fall in love with them as soon as you see them. We will be launching 3 new ranges on the programme, so make sure you tune in.